One girl's musings on loving, laughing, and running. 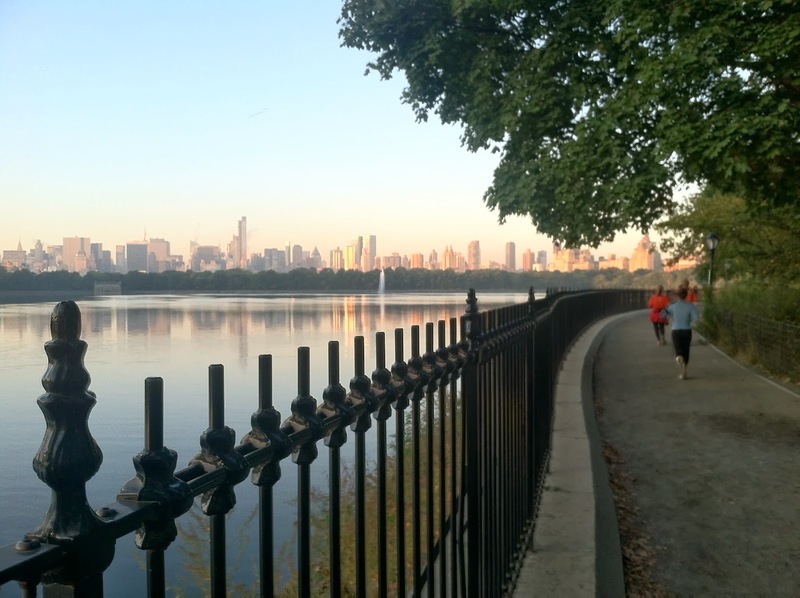 I started my day today with a fantastic 5 miler around the Reservoir in Central Park. The loop is just over 1.5 miles, the surface is packed down dirt, and it is beautiful. I ran around twice, and I wasn’t bored. Not even for a second. I had a little adventure on my way there – apparently the path I take into the park by the Met was closed. I ran by a huge tractor but since I could fit through, I assumed it was temporarily parked. Nope. And the workers were not pleased to see me on the other side. Nor did they endorse my decision to jump over the fence in order to get around the obstacle. Hey, I’m a runner: I do what I gotta do. Recently, I have been doing mostly evening runs. Partly because I’ve been a sleepyhead, partly because I’ve been going to the Run NYC group. Evenings runs have a great way of clearing my head after a day at work. But at my core, I’m a morning runner. I love feeling the crisp, clean air on my face, busting out miles before some people are even out of bed. It’s serene, and it’s good for me. It amps up my energy for the day, and the natural appetite it creates makes it easier for me to eat lunch. It kind of depends on my social schedule for the week whether I run in the mornings or evenings. It’s good to mix it up; keep it interesting! But this week, I’m happy to have all morning runs scheduled in this beautiful weather. I’m sure I’ll be singing a different tune come winter. I read somewhere that 4:00pm is the ultimate running time if you get up around 7:00am. I beg differ. I think it is a personal preference. Are you a morning, afternoon, or evening runner? Comments? Questions? Ideas? I'd love to hear from you! Email me at lovelaughrunner@gmail.com.